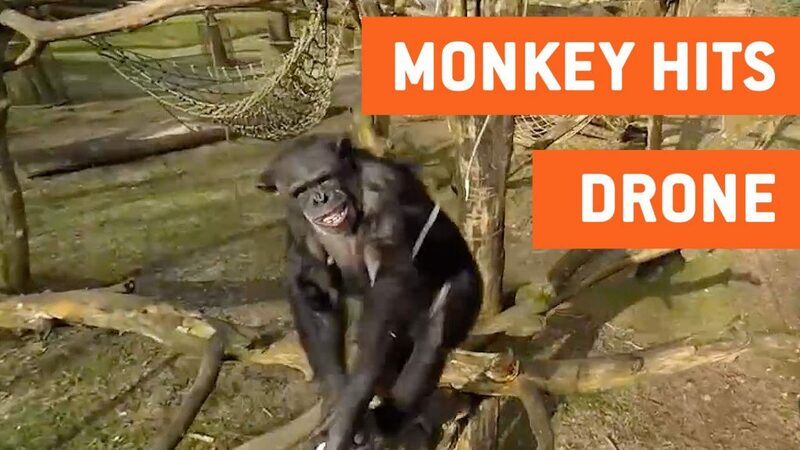 Calm and calculated – a chimp at a Dutch zoo took down a drone, squashing it with a tree branch. That’s pretty interesting (and a bit sad, if you’re the drone owner), but according to a paper published in the journal Primates, it may have more significance than it seems. According to the publishers, the chimp carefully planned the attack, just like a human would. This year, on April 10, a Dutch film crew was using a drone to document a chimp enclosure at the Royal Burgers Zoo in Arnhem. However, the chimps didn’t like it, so some of them picked up branches from a nearby willow tree and two females, Tushi and Raime, climbed up on scaffolding to get closer to the drone and strike it, as you can see below. “When the drone came a bit closer to the chimpanzees, a female individual made two sweeps with a branch that she held in one hand. The second one was successful and downed the drone. The use of the stick in this context was a unique action. It seemed deliberate given the decision to collect it and carry it to a place where the drone might be attacked. This episode adds to the indications that chimpanzees engage in forward planning of tool-use acts,” researchers write in the study. They sent the drone smashing to the ground, and then looked at it for a while with inquisitive faces, before ultimately abandoning it. The footage went viral across the globe, but people missed a few important details. For example, when the female actually strikes the drone, you can see a grimace: her teeth were clenched and she was obviously tense, but she showed no signs of fear. This suggests that she acted on the drone not out of fear – but as a calculated move. In other words, she planned to attack it. Prof Jan van Hooff, from Utrecht University, said: “The use of the stick as a weapon in this context was a unique action. It seemed deliberate, given the decision to collect it and carry it to a place where the drone might be attacked. This episode adds to the indications that chimpanzees engage in forward planning of tool-use acts,” Lukkenaar says, explaining the broader significance of the filmed event. This incident also shows the apes cautiously inspecting the contraption and even throwing it around before they lose interest in it. To make things even more remarkable, chimps at the zoo were never really taught how to use weapons and tools, they just picked it up themselves. Previous studies showed that the chimps at this Dutch zoo spontaneously and innovatively use up to 13 types of tools in a variety of ways, especially with sticks (for example picking up fruits that are too high in the tree).